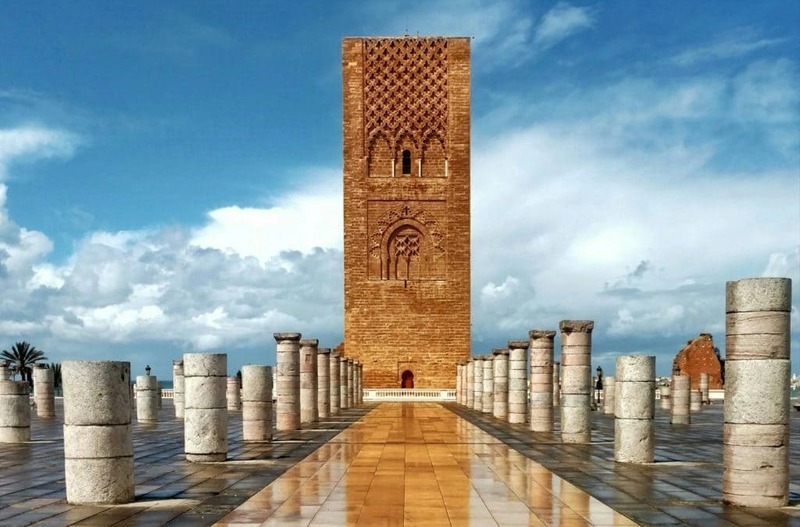 Hassan tower is an emblematic tower of Rabat, capital of Morocco, constituting the minaret of an unfinished 12th century mosque.The square tower is the minaret of a mosque built under Moulay Yacoub el Mansour, in 1196, the Almohad dynasty. The tower is 16m20 wide and 44m high. Its resemblance to the Koutoubia of Marrakech, and the Giralda of Seville is striking, which suggests that its height should be about double to respect the dimensions in force by Almohad architects. The walls are 2.5 m thick. The columns recall the naves of the old mosque, they come from the site of Volubilis.sawma3at hassan should have been the largest mosque in Morocco. it never saw the light of day, the earthquake of 1755 ends up completely destroying the colonnades. Kasbah Oudayas is a city in the city, a bit apart in Rabat, today even more than yesterday. But if there was only one thing to see in Rabat (what an absurd idea! ), Then would it be necessary to go to the Oudaya! Built in the 12th century by the Almohads, it was originally called Mehdiya. It is the kasbah that gave its name to the city. The ribat is indeed a fortified convent and it is here that monks-soldiers settled who were going to the holy war in Spain against the Christians. Chellah, or Chella, is the site of a merinid necropolis located on the site of an ancient city, in the present city of Rabat, Morocco, about 200 m from the Almohad ramparts. Chellah retains, however, the remains of a Roman city. The excavations have revealed the presence of an agglomeration of a certain importance, that of the city mentioned under the names of Sala, by Ptolemy, and Sala Colonia, in the route of Antoninus. The remains of the Decumanus Maximus or main road were cleared as well as those of a forum, a monumental fountain, a triumphal arch, a Christian basilica, etc. Chellah was abandoned for several centuries when the Merinids chose his site to build their necropolis. As indicated by the Kufic inscription on the entrance door, the work was completed in 1339 during the reign of Abu al-Hasan `Ali. The occupation of the site has been progressive and successive developments have resulted in the realization of a sumptuous necropolis. The mausoleum Mohammed V: The royal tomb in Rabat, It is on the esplanade of the tower Hassan and overlooking the mouth of the river Bouregreg. The mausoleum houses the tombs of King Mohammed V ex-Sultan Mohammed bin Youssef and his sons, Prince Moulay Abdallah and King Hassan II. Designed by the Vietnamese architect Eric Vo Toan, it was built between 1961 and 1971, 10 years of work with 400 Moroccan artisans. The building is characterized by its classic Arab-Andalusian style according to traditional Moroccan art. This place is highly symbolic for the Moroccan people. It is indeed, here, in the Hassan Tower, that Mohammed V directed the first prayer of Friday, after his return from exile of Madagascar before the declaration of independence. Mohammed VI Museum of Modern and Contemporary Art (MMVI) presents four hundred works by Moroccan artists, based in France and abroad, from the 20th and 21st centuries. It is the first independent museum in Morocco devoted to national modern art. Address: Angle Avenue Moulay El Hassan and Avenue Allal Ben Abdellah. a beautiful architectural achievement, very recent since inaugurated in 2014 Inside, the permanent exhibition offers a fine selection of works by contemporary Moroccan artists. This article has been prepared by Dar Rbatia team.